In the previous parts, we introduced how Trello and StoriesOnBoard work together in an agile workflow. You got insights about a new product’s development and got hints and tricks about establishing this workflow in a running project. Previous articles highlighted the opportunity for product rediscovery but didn’t expound the topic. Follow us in this part to earn experiences in product rediscovery. We wrote this article for Trello users but the workflow is suitable for other agile project management methods. 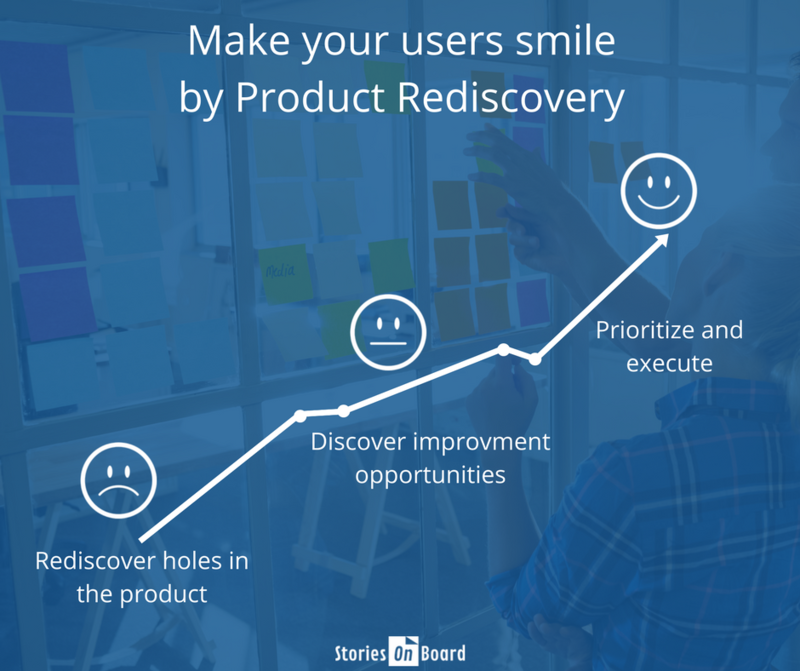 Rebuild your product’s story map from any old-fashioned backlog. 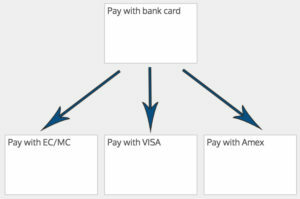 After synchronizing JIRA cards the process will be the same. The preparation process is no brainer. The only thing you have to do is importing cards from your Trello board into an empty storymap. In the previous part, we advised not to import older and archived cards but they can be useful, so import them. Read more about synchronization. Although you created the product’s plan in a good old way, apparently few features will miss from the final product. You can avoid this sad situation by giving a new chance to create a better backlog. Missing features often belongs to missing steps in the user journey, so we concentrate on users’ activities first. You have two option to rediscover the product. One of the best method when you create a brand new story map. Don’t let your team biased by existing tasks. Pick one of your users and tell her story. Follow the narrative flow and create cards from main activities and steps. Split big steps into smaller ones. Thereafter it’s time to import Trello cards and to arrange them below activity cards. If there aren’t tasks beneath an activity card, there can be a missing feature. Focus on these user steps. What kind of feature can solve the step or how can a feature serve a better user experience? After creating new features split them into tasks, prioritize and arrange them below releases. 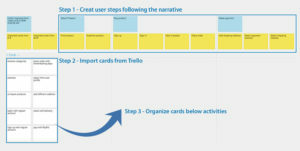 You can reproduce user journey right after importing cards from Trello. Use this method and you’ll get the products backbone faster. Be thorough, don’t miss steps out. Avoid this risk and try to retell the story to find the missing jigsaw pieces. So you found holes and solved the issues but what’s next? You have new ideas but don’t know how to continue? It’s time to find improvement options. Another great benefit of product rediscovery is that you’ll get tons of opportunities after story mapping. This step can follow the above-described process. First, try to make up at least one additional function or feature below each activity. All brand new tasks have to serve a better usability. Despite visualizing the products puzzled how to deal with the lack of idea? Don’t hesitate and organize a brainstorming. Facilitate teammates by using special brainstorming techniques, for example, reverse thinking. On the other hand, you can do market research or collect user requests. We appreciate our users’ needs and accepting requests on UserVoice. When your story map is full of good ideas, create MoSCoW releases and prioritize cards. Don’t forget to schedule new tasks and deliver cool features early and often to keep your customers smiling. An exciting outcome may be a discovered user or a whole user journey. Don’t hesitate to add new user stories or even a new story map. StoriesOnBoard supports creating personas on the top level of your story map. Make experiments by retelling only a selected part of the journey using additional story maps. Let us share a little secret. Professionals create several story map and dive deep into a selected part of the backlog to discover missing items. They organizing these mini-projects into collections. If you are convinced about the new part’s importance add it to the original story map. Prioritize and schedule new cards on the product’s backlog. Use these techniques to improve your product like a pro and flood your boss with positive feedback.